On our way back to Boston in 2003, to attend the conference, we drove north to Marshfield. I was curious about the cemetery in that town. Susanna White had remarried to Edward Winslow who also lost his first wife in that first winter in Plymouth. See the plaque above - click and it will open but depending on your browser either click back or close out the page at the top. 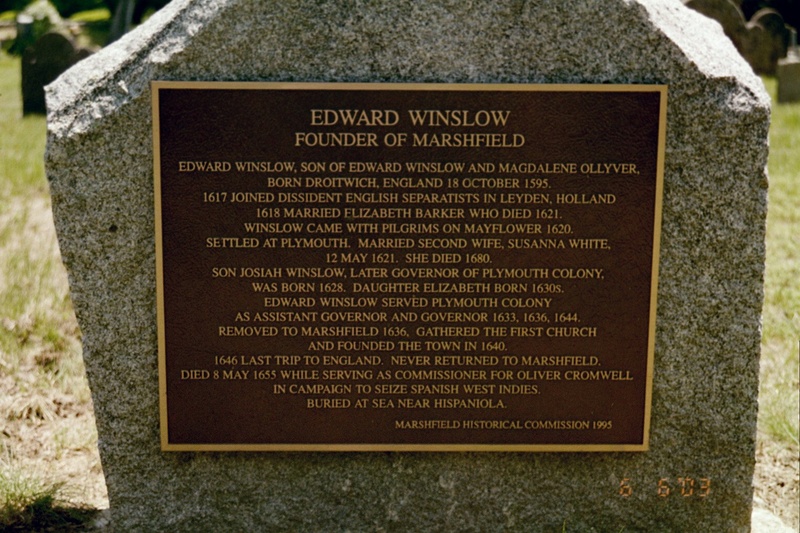 Because so many of the Mayflower passengers and some of their descendants final resting places are unknown the next best offering to their memories are monuments. In Plymouth, Massachusetts there is the National Monument to the Forefathers a very imposing tribute. I visited this monument in 2003. 2nd list - William White is 5th from the bottom above the paragraph.